One of our newest clients, Woodmere Art Museum in Chestnut Hill is opening an exhibition of work by John Follinsbee this weekend: John Folinsbee and American Modernism November 6, 2010 – March 6, 2011. Follinsbee was a local artist who achieved national acclaim for his work which blurred the lines between Impressionism and Modernism during the turn of the last century. There are several community events coming up in the next week that invite audiences to become more familiar with Follinsbee’s work. These events are free and open to the public; providing an excellent opportunity to get to know the Woodmere, which continues to celebrate the richness of art in the Philadelphia region. Sunday, November 7, 3 – 5 p.m.
Tour the museum alongside Woodmere staff and view the new exhibition John Folinsbee and American Modernism at this free community event. Thursday, November 11, 2 p.m.
Pamela Birmingham, Robert L. McNeil, Jr. Curator of Education at Woodmere, tours the exhibit, John Folinsbee and American Modernism, 1920-1940. Gallery talks are 45 minutes in length. Free program. Chestnut Hill is an ideal escape whether you’re a suburbanite or a city dweller – simply take the R8 to the end of the line, or if you’re driving, there’s always plenty of parking. 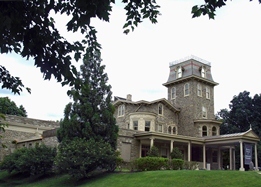 Enjoy a relaxing lunch on the lovely, cobble-stoned Germantown Ave; the Woodmere Art Museum is a leisurely walk along a shop-lined street from there. No matter where you’re from, it’s practically in your backyard!